Voxeljet AG, a leading provider of high-speed, large-format 3D printers and on-demand parts services to industrial and commercial customers, today announced the release of PolyPor C2 (PPC²). PPC² is an advanced PMMA 3D printing process to achieve overall higher quality outcomes in investment casting. The process will be officially presented at the 64th Technical Conference and Equipment Expo, taking place in Covington, KY, USA from October 15th to 18th, 2017. The new PPC2 is a modified version of the existing PolyPor PMMA processes, offered by voxeljet, which are primarily used to create investment casting patterns. Compared to the existing PMMA processes, models that are printed using PPC2 have an overall increased resolution. A combination of a high definition print head that prints with a resolution of 600 dpi, a reduced grain size and layer thickness, results in very detailed 3D printed models that are ideal for investment casting patterns. The material set causes almost no residual ash. Dr. Ingo Ederer, Chief Executive Officer of voxeljet, commented: “Our new PPC2 process will be initially offered on our VX200 system. 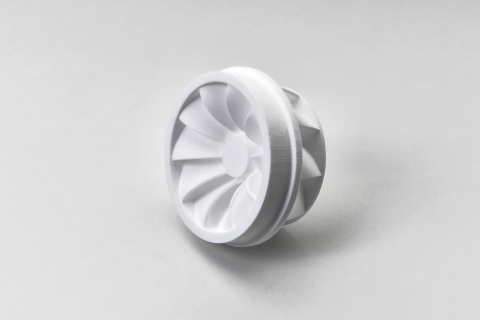 It is an affordable entry into 3D printing for investment casting foundries with an efficient part production for commercial castings such as turbine impellers and turbine blades. Thanks to our binder jetting technology, no additional support structures are needed. By means of this, precious build space can be used most efficiently by building parts stacked on top of each other”. Tobias Gruen (Product Manager, voxeljet) adds that “by using our new and improved binder, we expect our industrial print heads to have an increased lifetime at a high and consistent printing quality level. Moreover, the unbound PMMA powder can be reused and recycled for forthcoming printing jobs, which ensures efficient material usage”. voxeljet’s new PPC² process will be officially presented at the ICI 2017, a conference for investment casting held by the Investment Casting Institute in Covington, KY, USA from October 15th to 18th 2017. Currently, benchmark parts of the new PPC² process can be ordered from voxeljet´s HQs in Germany and from voxeljet America in Canton, Michigan. voxeljet is a leading provider of high-speed, large-format 3D printers and on-demand parts services to industrial and commercial customers. The Company’s 3D printers employ a powder binding, additive manufacturing technology to produce parts using various material sets, which consist of particulate materials and proprietary chemical binding agents. The Company provides its 3D printers and on-demand parts services to industrial and commercial customers serving the automotive, aerospace, film and entertainment, art and architecture, engineering and consumer product end markets. For more information, visit https://www.voxeljet.com.